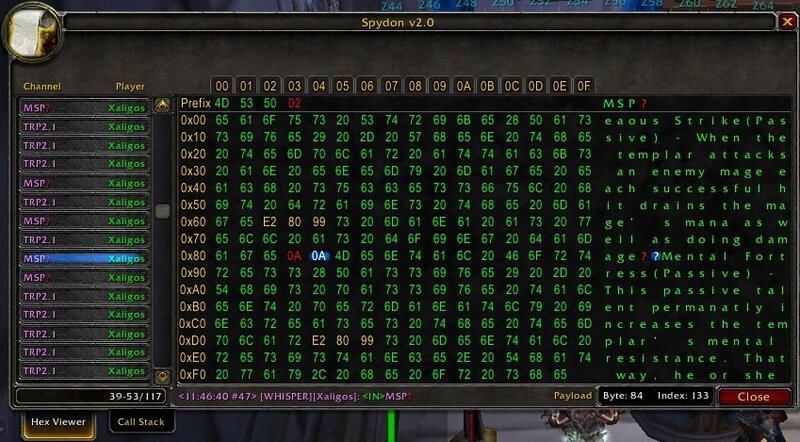 Spydon is a communications listener written to monitor the addon channel. It captures messages sent out and received and displays them in a new hex viewer frame. Call Stack data is now available for prefix registration and outgoing messages. This is done by hooking RegisterAddonPrefix() and SendAddonMessage() respectively. <IN> and <ECHO> messages show the registration call stack. <OUT> messages show the sending call stack. -Small optimizations in Unicode pattern matching. -New UI featuring a hex viewer with UTF-8 support. -Now runs a stack trace on prefixes when registered and messages sent out. -Now hooks SendAddonMessage() to report outgoing messages. <IN> messages are received from other players. <OUT> messages are sent out by SendAddonMessage(). -Listens to the AddOn channel and reports all traffic. -Includes information as to channel, sender, prefix, and message. In my own testing, I seem to keep getting variation in the number of C stacks appearing at the top of both types of call stacks. To fix this issue, the next version will run a string pattern match on top of a base stack offset to pop them off the recorded stacks. This will give it the display as intended. Another feature that I've been looking toward is the possibility of remote addon message capturing so you can have another system or even a friend help you debug communications. Another idea is to bring back classic view with some upgrades to show as the default tab and still keep the Hex Viewer and Call Stack tabs. 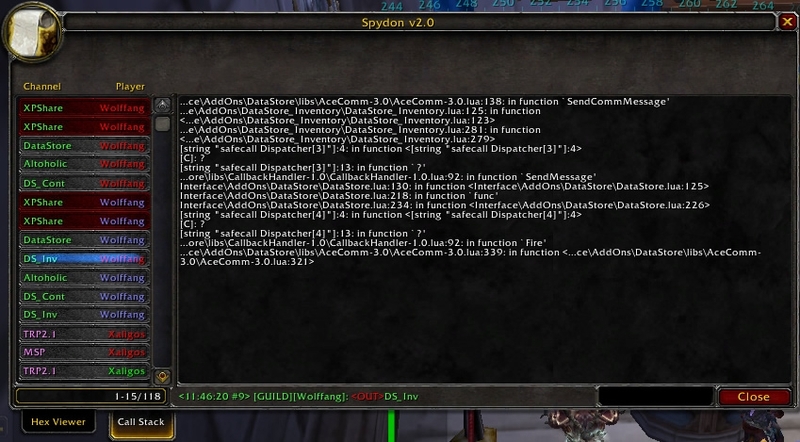 One feature that will eventually make its way in will be the ability to manipulate the addon message system and send out custom messages straight from the main window.